HAUʻOLI LĀ HOʻOMAIKAʻI! HAPPY THANKSGIVING! I was thinking about Thanksgiving Day memories today while I cooked dinner. It’s November 22, 2007. Thanksgiving Day. James and I are sitting at a table, poolside, at the Waikīkī Beach Marriott Resort & Spa. We’ve done an extravagant thing–flown to Hawaii for the weekend, essentially. Still jet-lagged, we’ve arrived early at the Moana Terrace and ordered sandwiches and french fries and beer. Well, we were there to see the one and only AUNTY GENOA KEAWE and Her Hawaiians perform. 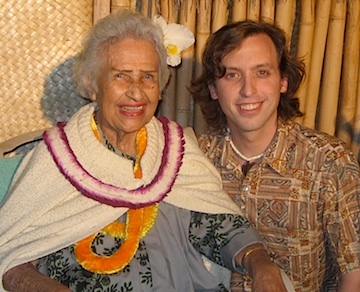 Listening to her voice, being inspired by her indomitable spirit, and watching the sunset over the beach in Waikīkī. I mean, is there a better way to spend Thanksgiving? Yes… It was an extreme luxury to be there. We’d saved our pennies all year to make it happen. It was a memory that will last a lifetime. And it continues to inspire me every day. The photo above is a great reminder of that night. A night we’ll never forget. 5. The opportunity to share this crazy journey with ALL OF YOU! **Crooner Note: Aunty Genoa’s family keeps the tradition alive and still performs regularly at the Marriott Waikīkī–including TONIGHT! Yay for Thanksgiving traditions! Please click HERE to check out their schedule.